Tales from the Den of Chaos: Tofutsies swirl! I realized a little bit ago that I really didn’t feel like doing any housework right now I never took pictures of the socks I’m working on right now! These are the Uptown Book Socks from Favorite Socks: 25 Timeless Designs from Interweave , in Tofutsies. This is the first time I’ve used this yarn, and I have to say…I like it. Normal is so long ago I have trouble remembering what it looks like. ANYWAY. 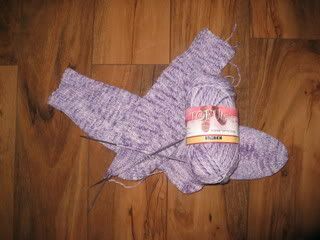 What I mean by that is, as I’m knitting with them, they don’t make my hands sweat (kind of important right now – it’s over 104 outside, and true to form my bedroom has heated up to approximately six million 85-ish), and in fact…they feel the opposite. They feel almost like they’re washing my hands as I knit. They feel as though the yarn is actually wicking moisture and impurities away from them. It’s probably the cotton. I’m not used to knitting with cotton at all, and this yarn is 22.5% cotton. Also…HA! I just looked at the label to double check the yarn content, and what do I see? Chitin is fiber from shrimp and crab shells! It’s naturally antibacterial! OHMYGAWD, I’M KNITTING WITH PURELL!!!!!!!! So the fiber content is 50% superwash wool, 25% Soysilk fibers, 22.5% cotton, and 2.5% Purell Chitin. I had already finished one at some point, before I got distracted and wandered away from them. Look! It’s a Tofutsies Swirl!! Is that not a peculiar pool effect there?! It wraps all the way around the foot, like a two-flavor soft serve ice cream swirl! I’m glad I find it kinda charming, otherwise it might be giving me conniptions right now. I turned the heel of the second start last night and started on the gussets, so hopefully I’ll have it done soon. If I can just keep neglecting the housework scraping a few moments here and there out of my incredibly busy domestic schedule, I might even finish it before the weekend. 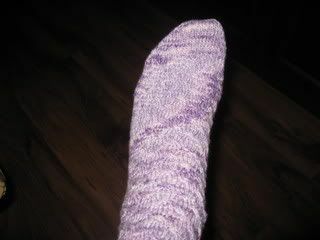 Not, mind you, that I’m going to want to wear hand-knit socks for a while. I don’t even want to be wearing shoes right now. I’ve gone as minimal on the clothing as possible for someone who has to keep running out of the house for one stupid thing or another. People…you are so glad I don’t have a web-cam in here. Very pretty. Just make sure no one in the family is allergic to shellfish (learned this the hard way when a friend was a pair of hers in our washer with some of my clothes. Not fun to have a full body rash!) that will end up handling them. Not everyone has a reaction, but the few that do... whoo boy!